A Blu-ray disc provides huge storage capacity and a high definition recording facility for the absolute best viewing option. 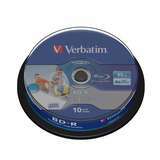 A digital optical disc storage format, the Blue Ray Disc recordable, (BD-R) can be used once and will keep memories safe. Blank Blu Ray Discs, can be stored safely until required and as Blu Ray storage is so massive, there is very little that cannot be copied completely onto the disc. Blu Ray has been developed to record, rewrite and playback High Definition Videos and offers more than 5 times storage than the standard storage systems. Using a Blue/Violet Laser to read and record the data which has a shorter wavelength than the usual red laser, making it more accurate and allows data to be packed closer together, giving higher capacity - between 25 and 50 GigaByte. Most manufactures anticipate Blu Ray overtaking DVD and CD's but it won't make them obsolete. We sell high quality Blu Ray discs from stock. 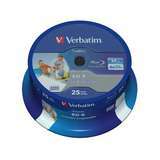 Perfect for anyone with huge amounts of data, the discs will reproduce images and data in a very high quality format. Available for next day delivery.